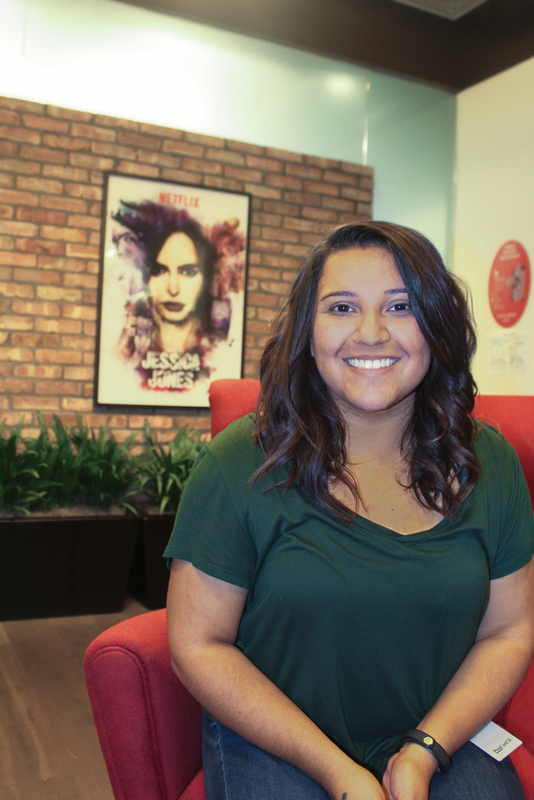 Katie Aguilar, who graduated in 2013 with a BFA in graphic design, currently works as a graphic designer on the creative services team at Netflix in Los Angeles, Calif. Below, Katie discusses her job at Netflix, her time at PUC, and advice she has for students wanting to follow in her footsteps. What is the most important thing you learned during your time at PUC? What stands out the most is learning to listen. Whether it was in a class, a meeting, or somewhere in the stillness of the Back 40, if I just listened, I learned something. There’s always someone with a different perspective or approach I would miss if I didn’t just quiet down and listen. I need reminding of that now and again. Who was your favorite professor while you were at PUC and why? That’s hard because I grew very close to my professors in the department of visual arts. Most of my PUC experience was spent in Fisher Hall, where my professors were really easy to talk to and always willing to help me through a project and oftentimes, life. So there isn’t just one, there are four. Shout-out to Milbert Mariano, Cliff Rusch, Haley Wesley, and Brian Kyle! How did your time at PUC prepare you for your career? It’s the little efficiencies I picked up along the way from my teachers or peers. Keyboard shortcuts, organization, timeliness, the importance of prioritization. It was really surprising when I got out into the “real world” how much those small things played such a big role in my day-to-day and made things run smoother. What is the most enjoyable part of your job? The most challenging? The most enjoyable part of my job is knowing I bring value to my team. We use these buzz phrases like “freedom and responsibility,” and it’s true, I have the freedom to work in a way that makes sense to me, the freedom to grow, to learn, to test new ideas and ask questions. My responsibilities to my team are for me to perform at my very best and I really enjoy being in an environment where I can thrive. That’s also the challenging part, I have the freedom to take my career where I want to, so it’s up to me to use my time wisely and make the most out of every opportunity. What advice would you give for other young aspiring designers? Talk to your professors! Get to know them! They’re such a valuable resource and can help you get through the creative fog you’ll inevitably have during projects. Be aware of what’s out there. Find out what other designers are doing, what new software is coming out that could improve or change the way you think about design. Don’t be afraid to try crazy ideas. Don’t limit yourself to one area of design. Lately all the job postings I’ve seen are looking for a jack of all trades. You don’t need to be an expert in every Adobe product but knowing some fundamentals can come in really handy later on. Go for it! The only real limit to how far you can go is often set by you. Don’t be afraid of messing up or not getting the exact result you wanted. Just keep going for it. You’ll surprise yourself how far you really go.